Would I ever have listened to The Slideshows had not the band's singer been Marcel Hulst? That answer is most likely no. Chances are the music would never have reached me. Hulst is the singer in Maggie Brown and Mountaineer, both veterans on this blog. So it's only logical attention is given. For those cheering already, there is a slight caution. In The Slideshows Marcel Hulst is the singer and not much more. That fact wins the band several points in my book, but lets keep it there and judge the band on its own merit and music. 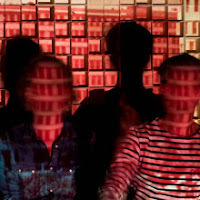 The Slideshows is a trio from Amsterdam. After releasing its first EP in 2016, 'Sunrise Surprise', the band built its own studio and started to work on its full length debut. This is released this weekend with a release party in De Nieuwe Anita in Amsterdam (23-3). Auke van der Wielen plays bass, keyboards and creates beats, Floor Stevens drums and percussion. On its first full length album The Slideshows delivers what it promises: psychedelic, electronic, indie, popmusic. Songs where the electronics and beats are harmoniously mixed with more organic instruments like guitars, organ and drums. In some songs the electronics win out more and in others the organic. It makes for a diverse album filled with a few pop gems. Being not to big on synthpop bands, my points of reference are perhaps limited and most likely 80s based, like Soft Cell and Pet Shop Boys, later on in the album Depeche Mode. Although all bands (duos) have released a few great singles, they never became bands to follow to me and there are no albums of either in the home. The Slideshows by weaving in guitars come closer to what I prefer to hear on a daily bases. Another point scored. Especially the first few songs on the album score well here. 'Thunderbird' has this upbeat sound, sprightly synths and a mysterious atmosphere in the middle section. Or 'Inside Out'. A guitar riff plays a role in the intro, to evolve in an early Duran Duran song like 'Girls On Film' was, bar the brazen outgoing nature of the new glam boys. While 'Sparks Unite' has that strong melancholy mood I know so well from Marcel Hulst's other work. The electronics around make it a different guise not a different song. 'Club 11' has this beautiful chorus. It also needs to be mentioned that the further I move into the album, it is hard for me keep my enthusiasm. Not all songs are able to take on the barriers my ears put up. Basically the same happens what happened in the 80s with albums from the bands I mentioned and I could add Spandau Ballet or Howard Jones just to mention two other synthpop acts of the day. My attention no longer is caught and moves on elsewhere. To sum up, The Slideshows present some excellent songs at the start of this album, where the mix of pop and synths really shines through, a level the band does not keep up. It has to do with more staccato delivery and less melody in the songs. Where the beats and electronics win out over the melody. It has everything to do with my preferences in music. In general the 80s simply were not my decade musically. If however this is your favourite decade The Slideshows may just offer what you like best.